WASHINGTON, D.C. -- Many countries on the front lines of the recent migrant crisis in Europe are among the least-accepting countries in the world for migrants, according to Gallup's new Migrant Acceptance Index. Nine of the 10 countries that score a 2.39 or lower (out of a possible 9.0) on the index are former Soviet bloc countries -- with most located along the Balkan route that once channeled asylum seekers from Greece to Germany. Israel, which has dealt with its own influx of asylum seekers from Africa in the past decade, is the only non-European country with scores this low. Gallup created the Migrant Acceptance Index to gauge people's acceptance of migrants based on increasing degrees of personal proximity. The index is based on three questions that Gallup asked in 138 countries in 2016 and the U.S. in 2017. Now, I would like to ask you some questions about foreign immigrants -- people who have come to live and work in this country from another country. Please tell me whether you, personally, think each of the following is a good thing or a bad thing. The response "a good thing" is worth three points, a volunteered response of "it depends" or "don't know" is worth one point, and "a bad thing" is worth zero points. The index is a sum of the points across the three questions, with a maximum possible score of 9.0 (all three are good things) and a minimum possible score of zero (all three are bad things). The Migrant Acceptance Index score for the world is 5.29. Seventy-seven countries score higher than this average, while 61 score lower. A majority worldwide (54%) say immigrants living in their countries is a good thing. 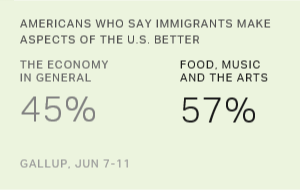 Slightly fewer -- but still half, at 50% -- say an immigrant becoming their neighbor is a good thing, and 44% say an immigrant marrying a close relative is a good thing. People in Eastern European countries, who are least accepting of migrants in general, are also among the most strongly opposed to accepting any Syrian refugees in their countries. At least half of adults in seven of these least-accepting countries believe their countries should not accept any refugees. In Macedonia, Hungary and Montenegro, the countries with the lowest Migrant Acceptance Index scores in the world, at least two-thirds say their countries should not admit any Syrian refugees. But there is evidence that people in these countries -- many of which have long histories of conflicts with neighboring countries -- were already predisposed to be suspicious of outsiders, and the influx of refugees further inflamed these attitudes. Even before the crisis, the majority across Eastern Europe said that migration levels in their countries should be decreased. The same is true of Israel, where three in four residents in 2012 -- the year before the country finished building a fence along its border with Egypt to keep out migrants from Africa -- said they wanted immigration decreased. As opposed to the least-accepting countries, which are geographically and culturally clustered, the most-accepting countries for migrants are located in disparate parts of the globe. The top two most-accepting countries could not be farther apart -- Iceland with a score of 8.26, and New Zealand with a score of 8.25. However, a common thread tying many of the most-accepting countries together is their long history as receiving countries for migrants. While the highest-receiving country in the world, the U.S., does not make the top 10 countries, it does make the top 20 with a score of 7.27. The Middle East, excluding the Gulf Cooperation Council countries, is the next-lowest region, with a score of 3.70. South Asia, Southeast Asia, Northern Africa and non-EU countries in Europe all score lower than the global average. The regions with the highest index scores are Oceania (Australia and New Zealand) at 8.02 and Northern America at 7.27 (this currently includes just the U.S.; Canada will be surveyed later in 2017). Worldwide, adults in certain demographics are solidly more accepting of migrants than others are. For example, acceptance rises with education. Those with at least four years of education after high school or with college degrees are the most likely of all education groups to be accepting, with an index score of 5.67. Those in the highest 20% income group -- who are also more likely to have higher education -- also stand out in their acceptance of migrants compared with those in all lower income groups. Residents of urban areas also are more likely to be accepting, as opposed to those living in rural areas. First-generation migrants themselves are more accepting of migrants than are the native-born in their countries. The index score for first-generation migrants is 5.94, versus 5.18 among native-born residents. Migrants who have been in their adopted countries for less than five years (newcomers) are the most likely to be accepting of migrants, with a score of 6.0. However, consistent with previous Gallup research on migrants, the longer that migrants stay in their new countries, the more like the native-born they become in their attitudes. While they are still more likely than the native-born to be accepting of migrants, with a score of 5.80, those who have been in their adopted countries for more than five years (long-timers) are less likely than newcomers to be accepting of migrants. The United Nations' 2030 vision for "peaceful, just and inclusive societies" includes migrants. The data reveal some countries are light-years away from realizing this vision, with low acceptance of migrants permeating all levels of society. But with the lightning rod that migration has become in most parts of the world, this will be a challenge even in countries where migrants are more accepted. For example, in the U.S., which is in the top 20 most-accepting countries for migrants, President Donald Trump's campaign pledge to build a wall to curb illegal immigration resonated with enough Americans to help get him elected. And after his election, his executive orders to impose a 90-day ban on issuing new U.S. travel visas for citizens of six predominantly Muslim countries and to stop all refugee resettlement in the U.S. for 120 days found favor among his political base. In all countries, Gallup finds that people place conditions on their responses. Some percentage of the population in every country says "it depends." But in some places, who these migrants are may factor more heavily into whether they are accepted. For example, in Russia, where the index score is among the lowest in the world, more than 40% of residents say "it depends" to each of the questions. Future articles will delve deeper into the subjective and objective aspects of people's acceptance of migrants worldwide, offering some potential clues as to what drives their acceptance of migrants -- or lack thereof. Dr. Anita Pugliese contributed to this analysis. Americans are more positive now than in 2007 about the effects that immigration has on several aspects of life in the U.S.
Americans' attitudes about immigration have not changed significantly since Donald Trump's presidential campaign featured a prominent negative focus on immigration.